Tuesday's papers in Finland discuss the strike that has brought both local and long-distance train services to a standstill throughout the country. And brain researchers are now looking into the connection between Finland's frequent breaks at school and high academic performance. 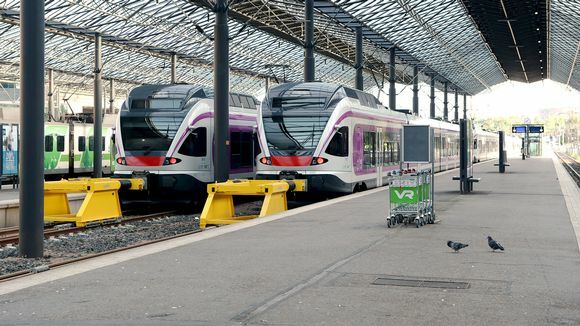 Finland's largest circulation daily Helsingin Sanomat reports on the train driver walkout that has stopped all of the state-owned railway operator VR's passenger and freight routes and local HSL commuter trains in the capital city region. The strike is expected to keep passenger and freight trains out of operation from 6 pm Monday to Tuesday night midnight in a protest against government plans to introduce new private operators to the Finnish rail network. HS says that over 1,000 train trips will not run due to the strike, including 300 long-distance routes and 800 commuter train connections. The paper says the walkout will affect the capital city region the most: as approximately 200,000 residents of the area are estimated to use the trains daily. Trains between Finland and Russia are the exception: both the Allegro and Tolstoy routes will follow normal timetables. VR told the paper that although the drivers will return to work at midnight, some changes may be necessary on Wednesday as well, and some routes may be cancelled. HS advises its readers to check the VR website for more information. Helsinki Regional Transport (HSL) also has information on alternative bus and tram routes that are available during the strike. HSL representatives have also been dispatched to the stations that normally handle the most traffic, to offer their assistance, the paper says. Monday, August 14 saw the switch to HSL's winter timetables and marked the first day of new tram routes serving Helsinki, as well as new bus routes to eastern parts of northern Helsinki. Find more information on the specifics of the route changes and the new timetables here. The tabloid Iltalehti takes a closer look at how Finland's coach companies are handling the situation today in terms of long-distance journeys. IL says all of the major bus services have prepared for the strike by adding extra routes between their most popular destinations. Jarmo Paunu tells IL that his Paunu bus company is equipped to add new routes if demand exceeds supply, and competitors Onnibus and Pohjolan Liikenne have said the same. Pohjolan Liikenne has also added several buses to routes connecting the Helsinki city centre with the airport. Finnair buses will operate as normal and HSL has also added runs to its routes serving the airport. Pohjolan Liikenne's online sales director Ilona Pirhonen tells IL that travellers should in any case reserve extra time for their airport connection, as it is impossible to predict how many passengers will use the added services ahead of time, and many buses may be full. And in other news, Aamulehti out of Tampere starts this Tuesday with news of a possible new explanation for Finnish school success. Neuroscientists have discovered that a quick break with exercise activates the brain for 45 minutes of optimal learning, the traditional length of a class in Finland, indicating that the Finnish tradition of a short recess in the fresh air in between classes may be one reason why Finnish children have demonstrated high levels of aptitude on international tests. The short break was found to have the most benefit for school children that did not move very much as a rule, and who struggled with learning difficulties, AL reports. Teacher Hannele Rintatalo from the Isokyrö primary school has learned that if her small pupils get too restless during class, it is time to head outside. "A few rounds of 'Simon Says' or something like it, and they are ready to learn again. If kids can move around a bit in between classes, they are able to concentrate better during instruction," she says. Helsinki University's cognitive science professor Minna Huotilainen says she believes that the short breaks between classes are one reason Finnish schools have performed so well in the past. "Finland's school breaks are now the subject of international attention. Many countries admire our ability to get outside no matter what the weather. I wouldn't be surprised if it was a factor in the Finnish school system's learning outcome successes," she says. Official recommendations in Finland say that children under school age should spend at least three hours a day outside playing, while for school-age children, the recommendation is 1-2 hours daily.